So said a line in John Peel's biography and that could be my epitaph as well. Rummaging in the loft I can across my old primary school reports from Kenilworth Thorns County Junior and Infants School. 1961 - Feb: Very good work. Mark is a conscientious and capable child. 1961 - Jul: Good work on the whole. Mark needs to work at a faster pace as this has hindered his progress. 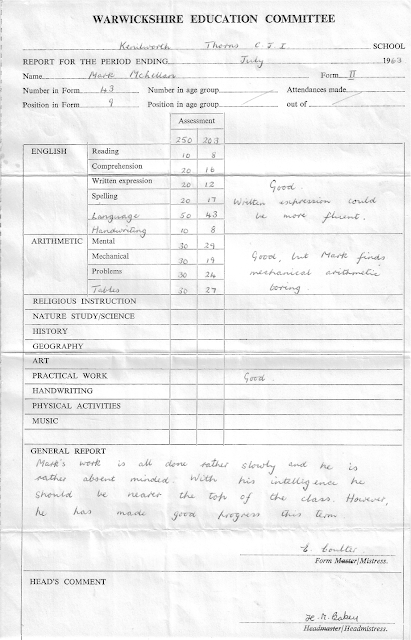 1962 - Feb: Mark has worked well and has achieved quite a good mark. 1962 - Jul: Mark's work is generally of a good standard but he is slow at times. 1963 - Feb: Mark has made good progress, but he could do even better if he made a bigger effort. He is not working to the limit of his ability. 1963 - Jul: Mark's work is all done rather slowly and he is rather absent minded. With his intelligence he should be nearer the top of the class. However he has made good progress this term. 1964 - Jul: Mark is well-behaved and very helpful in class. He works well and has made excellent progress. He has succeeded in speeding up his rate of working quite considerably. I think July 1963 (age 10) says it best "Mark's work is all done rather slowly and he is rather absent minded. With his intelligence he should be nearer the top of the class." The story of my life in a nutshell.